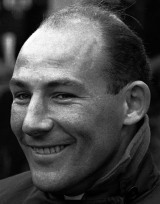 Stirling Moss is often tagged as the best driver never to win a world championship, and while some might be willing to debate that, what is certain is that a fair number of inferior drivers have lifted the title over the years. In an 11-year career that included some of the greats and in which the drivers had to do all the work, he was outstanding. He started in local hill-climbs as an 18-year-old before turning to racing in 1949. Successes in Formula Three secured him a place in HWM's Formula Two team, and within two years he was battling with the legends of Formula One as well as making an impression in sports cars. His early years in Formula One were unsuccessful, largely because he was in British cars at a time the Italian marques were dominant, but in 1954 he switched to Mercedes, returning to the sport for the first time since the war. He was sent away with the suggestion he drive a competitive car to see what he was capable of, and with that in mind, Moss bought a Maserati. Even though the season was a disappointment, his third place in his first outing - at Spa - persuaded Mercedes to offer him a drive in 1955 alongside Juan Manuel Fangio. The relationship blossomed from the off, the old master and the young pupil. Moss won the British Grand Prix at Aintree - debate continues to this day as to whether Fangio allowed him to do so - and Moss finished the season third as Fangio secured the third of his five titles. That year he also won the gruelling Mille Miglia. However, Mercedes withdrew in the aftermath of the Le Mans disaster and Moss was forced to turn to Maserati in 1956, winning twice and finishing second to Fangio in the championship. A return to a British marque followed in 1957, but by this time they had become competitive. He won another three races for Vanwall but for the second time was beaten by Fangio in the championship. Fangio's retirement opened the door for him in 1958, but despite four wins he was beaten into second by one point by Mike Hawthorn, even though he had managed only the one victory. Again, Moss had to move teams as Vanwall folded in the wake of Stuart Lewis-Evans' death in the season finale in Morocco. In 1959 and 1960 Moss drove assorted cars, mainly Coopers, winning twice in 1959 and then at Monaco in 1960. He was sidelined for much of the season after a bad crash in practice at Spa on the same weekend two British drivers died in the race itself. In 1961 Ferrari dominated under rule changes which caught British manufacturers cold, but Moss' skill was underlined in Monaco where his underpowered Lotus held a trio of snapping Ferraris at bay lap after lap. On faster circuits even he was unable to compete, but a second win came at the Nurburgring. He finished the year third in the championship, completing a seven-year sequence of four seconds followed by four thirds. For 1962 Enzo Ferrari was prepared to offer Moss anything to drive for him, but in a non-championship race at Goodwood in April Moss crashed heavily and was critically injured. He was in a coma for a month, and spent the rest of the year slowly recovering. Twelve months later he returned to Goodwood to drive for the first time, but almost immediately returned to the pits and announced his retirement. He explained what had come naturally now required conscious decisions, and that was not good enough. He was still only 32, the same age as Graham Hill who was to win the world title for a second time six years later. In enforced retirement Moss became, if anything, more famous and marketable as a commentator, author and celebrity, and almost five decades after he last raced he remains an ebullient, popular and well-known figure. Moss was one of the first drivers to recognise his commercial worth, and he skillfully and successfully exploited that to the full, negotiating drives firmly and selling himself dearly. He managed this without compromising his driving. His drive at Monaco was a two-fingered defiance of the mighty Ferrari with its vast budgets and superior technology. In a small, outdated, underpowered Lotus with the side panels removed to allow Moss to keep cool, he used every ounce of his skill and experience to fight off three Ferraris which took it in turns to attack him throughout the race. "It is doubtful," wrote the Guardian, "any other British or foreign driver could have defeat this attack." Aside from his career-ending crash, the 1960 Belgian Grand Prix was a wretched weekend not only for Moss but also for British motorsport. Moss crashed heavily on the Saturday when a rear wheel came off his Lotus, suffering multiple breaks, and missed most of the season. The next day Chris Bristow and Alan Stacey were killed in the grand prix itself. "Better to lose honourably in a British car than win in a foreign one"
"If God had meant for us to walk, why did he give us feet that fit car pedals?" "There are two things no man will admit he cannot do well: drive and make love"